The Department of Justice says it will sue North Carolina for a new law requiring ID to vote. So how come DOJ lets Illinois slide? Illinois requires ID as well. And not a peep of protest out of DOJ when Barack Obama is asked to show his ID. ANNISTON, AL - Over the years, many Civilian Marksmanship Program firearms purchasers have asked if the CMP would consider offering reliable, reasonably-priced and prompt maintenance, repair and upgrade of USGI-issue rifles. The CMP has responded and the answer is "YES" we will. Effective October 1, 2013, the CMP Custom Shop will open for business, providing a wide variety of repair, upgrade and custom services for a wide range of U.S. Military rifles, specifically those issued in early eras. The CMP Custom Shop will be able to perform virtually any normal upgrading, accurizing, customizing and refinishing (not to mention regular repairs and troubleshooting) to the types of rifles that we are currently selling or have sold in the recent past. CMP will specialize in working on the M1 Garand, M1 Carbine, 1903 and 1903A3 Springfield, the 1917 Enfield and the Krag. Other rifles like the Remington 40X, Mossberg 44 and H&R Model 12 can also be serviced if needed. CMP will NOT be working on shotguns, pistols, revolvers, M14/M1A, AR15 style rifles or other commercially-produced modern rifles. For years the CMP has been swamped with just getting newly purchased rifles prepped and out to customers. So the branch into repairs and customization may be a sign new orders are dropping off, or perhaps a sign the CMP knows its supply of surplus rifles available to sell will eventually dry up. Regardless, no one knows more about American military surplus rifles than the CMP. And it's good to know that expertise will now be available to keep our existing but aging firearms operating at peak performance. Al Qaeda's new Twitter account? It's been suspended. Still I'm wondering. Since everyone knew this was al Qaeda, what took five days? SNL opens its new season by skewering Obamacare. Maybe there's hope after all. Looking at this, it strikes me SNL has more editorial sense than the NBC News division. The NSA grows ever more zealous in tracking our every move. According to the Times, the NSA's not saying how many people now receive this special interaction surveillance - or whether any suspicions of wrongdoing are necessary to trigger it. "I suggested that my daughter read Animal Farm. A few days later I found this on my desk." Smaller footprint means less for the government to stand on. 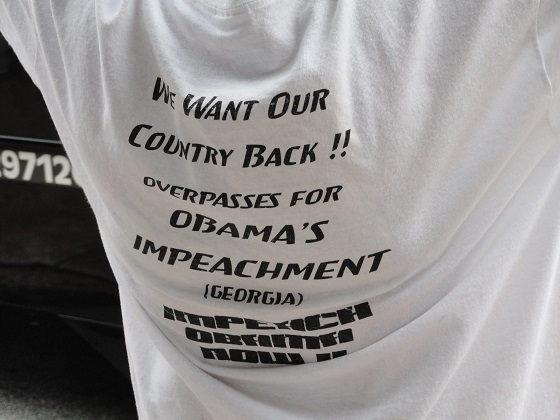 Overpasses for Obama's Impeachment held protests across America on Saturday. 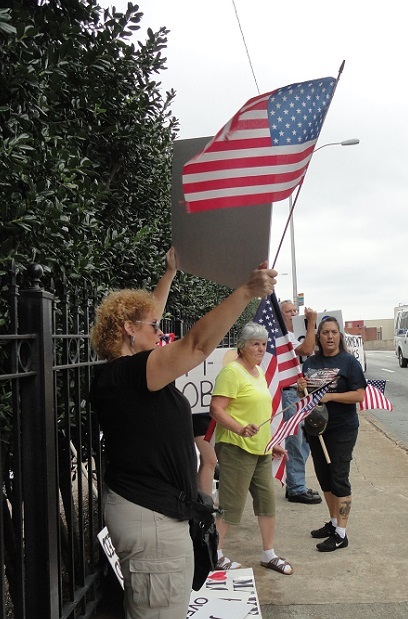 Here's a random sample of what happened when drivers on Georgia 316 saw a "Honk to Impeach" sign on the U.S. 78 overpass just outside Athens. It's Friday, September 27, and another Don and Doug comin' up later today! If you've seen demonstrations overhead as you've driven down the Interstate and wondered what it's all about, we'll clue you in beginning at 1 pm EDT. Live chat with participants. Your calls welcome too. Don and I go live at 1:00 pm EDT on BlogTalkRadio. Update: James Neighbhors, founder of Overpasses for Obama's Impeachment is now among confirmed guests for today's show. Obamacare proponents appear to stoop to ever more desperate measures to keep Americans believing in the Obamacare myth. Advertisements featuring cuddly baby animals. 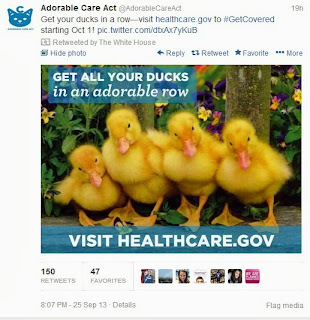 These ads are from an undisclosed source posting to Facebook as "The Adorable Care Act." No way to tell who's behind them. Is this part of one of those White House nudge operations? Government obviously thinks if it can keep you emoting, you won't bother with rational assessment. While the White House may not be behind the animal ads, it has re-Tweeted them. 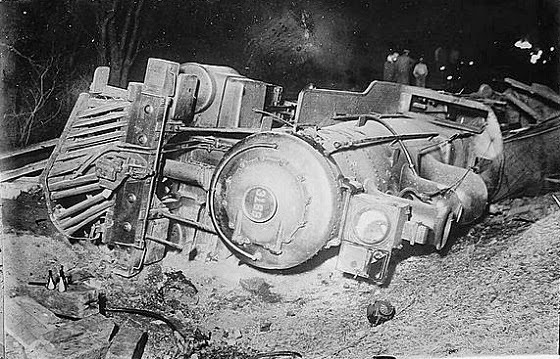 Obamacare's a train wreck in the making. I don't care how many kittens and ducklings they throw at us. Whether by accident or design, Obama and his peeps have a real knack for letting arms get into the hands of cartels, terrorists and renegade Muslim Militias. Good thing the UN Arms Trade Treaty exempts states from restrictions in the trafficking of arms, otherwise someone might get in serious trouble over this kind of stuff. As he signed the document, Kerry called the treaty a "significant step" in addressing illegal gun sales, while claiming it would also protect gun rights. Bill de Blasio was also among the legislators who honored reviled Zimbabwe despot Robert Mugabe at City Hall in 2002 — an event organized by Councilman Charles Barron. De Blasio was in his first term on the City Council, while Mugabe was already notorious for starving his people, jailing or torturing his political rivals, seizing land from white farm owners and promoting anti-gay policies. Mr. de Blasio is the Democratic Party's nominee for NYC mayor. And de Blasio has been endorsed by President Barack Obama, who has himself aligned with a collection of most radical Leftists in the past. A bystander with a gun reportedly made a big difference during the siege at the mall in Nairobi. Sounds like three thugs picked the wrong target. Off duty sheriff's deputy, accosted while out for a late night run, shoots three out of three perps. One of them shot fatally. St. Louis station KMOX shares details. "Mystery Solved! 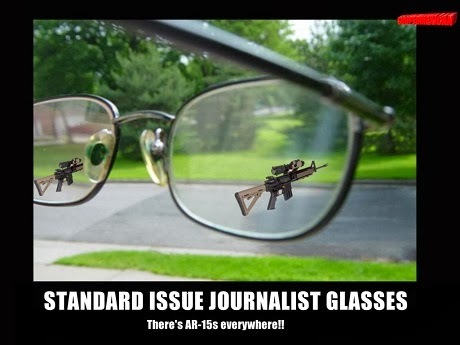 ‘Standard Issue Journalist Glasses’ Explain Why AR-15s Seen Everywhere"
Meet Bill de Blasio, Democrat candidate for mayor in NYC. Now, Mr. de Blasio, a Democrat, describes himself as a progressive. He has campaigned for mayor as a liberal firebrand who would set out to reduce inequality in the city by offering more help to poor families and asking wealthy residents to pay more in taxes. He said that seeing the efforts of the Sandinistas up close strengthened his view that government should protect and enhance the lives of the poor. I wonder if New Yorkers are following how socialism is crumbling in Venezuela post-Chavez. Troops occupy the toilet paper factories in Venezuela, but there's still not enough toilet paper. Troops occupy the power plants, yet still the grid still wobbles and fails. For NYC, de Blasio envisions taxing the rich more. Will New York's "rich" finally say no and move on when a mayor with an out-right socialist resume takes office? Oh, by the way... The Times is also reporting Barack Obama has endorsed de Blasio's bid for office. When a homeowner in New York noticed his pro-Second Amendment signs kept disappearing, he set up a camera. If the officer seen taking one was acting under the color of law, he could have left a note, or posted a warning if he deemed the sign in some kind of violation. Whether it is merely fundamentally flawed legislation or a true Trojan Horse, it is increasingly clear the Affordable Care Act is a disaster in the making. It is time to defund and roll back this approaching trainwreck before further damage is inflicted on the nation's healthcare system and the overall economy. Elitist law prof says the Constitution "stinks." Americans spend an inordinate amount of time arguing about how best to interpret the Second Amendment, but the real question – the one we should be asking – is this: Why are we so fixated on a 226-year-old piece of paper? Smugness will only give so much cover. Leftists are increasingly bold in their attacks on our nation's foundation, and its written declarations of personal liberty. 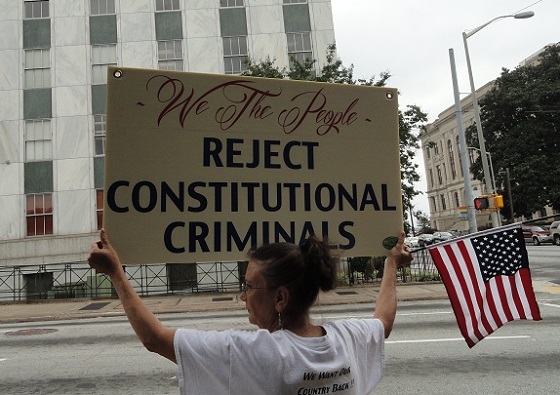 For years, progressives have sought to circumvent the Constitution by steering around it. Question now is, how long before their direct assault moves beyond just rhetoric? The Army appears on the verge of a tattoo crackdown. The State of Maryland has dropped charges against the father who dared ask verbal questions at a Common Core town hall recently. But even in dropping the charges, the state defends the officer's actions, and calls the parent disruptive. Here's video of the arrest. Who's being the disruptive bully here? Glenn Beck did a segment on this incident. It's one of his best, well worth a look. Reminds me of lyrics from a '60s song by Buffalo Springfield. Step out line, the man comes and takes you away. Everybody look what's doing down. Time to break out the Alpenflage! I picked up four of these Swiss surplus light jackets for around 20 bucks from Sportsman's Guide earlier this year. About five bucks a piece. I ordered under a free shipping special, making the deal even sweeter. Here we go again. Obama bin Lyin'. Or, at the very least, Obama Be Spinnin'. 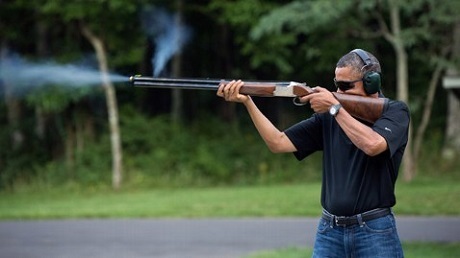 Over the weekend, the president claimed gun right rights advocates intentionally seek to arm dangerous folk. 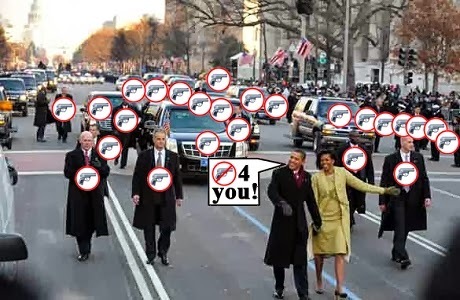 President Barack Obama accused opponents of gun control of fighting to allow “dangerous people” to own guns in a speech on Saturday to activists at Congressional Black Caucus, promising he would revive his failed gun control efforts following recent urban shootings in Chicago and Washington D.C.’s Navy Yard. I haven't done a hard count. But mass shootings do seem to be up during the Obama years. Or maybe it's the over-saturation, agenda-driven media coverage that just makes it seem that way. And in the case of the DC shooting, there were a series of events in the life of the troubled shooter where law enforcement and government health care officials were in a position to see some something and do something regarding Aaron Alexis's mental state and his lawful access to firearms, but it appears it was government that chose to look the other way. Maybe Barack Obama should ask himself if there's something about his era of promised hope and change and fundamental transformation that's pushing more already disturbed persons over the edge. More gun control is not the solution. More crazy control might be a better starting point. And that includes rolling back some of the craziness in runaway government. It sends the national guard to occupy toilet paper factories. Venezuela's electrical grid not faring much better. So government tries to blame failures on "right wing extremists." You guessed it. More troops deployed. Obamacare insurance exchanges begin signing up folks on October first. Will you be among the masses rushing to jump in? The above words were encountered by some fourth graders on an Language Arts worksheet at school in Louisiana. School system defends the assignment, saying it's in line with the new Common Core curriculum. Fourth grade now introduces kids to terms like pimps and mobsters. What kind of future are government schools pushing our kids toward? At a congressional hearing yesterday, most the Democrat representatives in attendance walked out before Patricia Smith spoke. Smith is the mother of Benghazi fatality Sean Smith. Covering for the Obama team no longer covers it. What we're witnessing by the Democratic Party is being accomplices after the fact. The president and his administration seem to steer farther and farther from reality and accountability. Whether DC elites are ready to move forward or not, is it time for "we the people" to make the case for impeachment? We also want to ask what things you may be doing to publicly express displeasure with the Obama regime. Friday's Don and Doug will also look at a mix of other topics of the week including how the Left and its media attempt to rewrite the narrative after the DC Navy Yard shooting failed to follow their pre-planned script. And a debt ceiling showdown is around the corner. But don't worry, Obama says raising it isn't the same as increasing the debt. Don and Doug go live at 1:00 pm Fridays on BlogTalkRadio. Question is, Mr. Speaker, can we count on you not to surrender? The more I learn about Obamacare, the more it appears to have been written specifically to disrupt the system we had, while laying additional charges on those employers who dare continue coverage. This year, companies have to pay $1 or $2 “per life” covered on their plans, a sum that jumps to $65 in 2014. And health law guidelines proposed recently mandate coverage of employees’ dependent children (up to age 26), but husbands and wives are optional. If Obamacare proves anything, it's that the Trojan Horse is still an effective tactic. I went to Kroger store tonight where a high school rifle team and high school Marine Corps JROTC students were holding competing fundraisers at the same time outside the entrance. In this era of fundamental transformation, you won't find a scene like that in most communities. I appreciated these young witnesses for traditional American values and activities. Yes, I donated to each. Of course, he's the same guy who declared a "red line" in Syria and then said he didn't. He also said you could keep your doctor and health insurance plan under Obamacare. Pump action shotguns similar to the one used in the Navy Yard shooting have been around since the 1890s. But after chalking up the casualty count in DC to an AR-15, and then finding out the gunman only had a shotgun, the media's stuck with a problem of saving face. So it launches into the demonizing the pump shotgun. Anti-gunners are trying to mobilize their troops around the DC shooting, but so much of what they claimed earlier this year falls flat here. There was no semi-automatic "assault rifle" involved, no "high capacity" magazine. Not even a detachable mag designed for quicker reloads. Even Mike Bloomberg's Mayors Against Illegal Guns featured a pump shotgun as an acceptable sportsman's gun in one of their commercials pitching more gun control earlier this year. 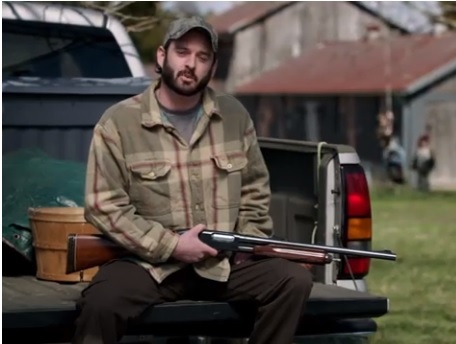 Politicians will likely be excessively shy about going after people's bird guns or home defense shotguns. Especially after seeing the results of last week's pro-gun recall results in Colorado. Which brings us back to Obama. His press secretary kept repeating the same tired spin after the Navy Yard shooting, and seems to keep the door open for additional unilateral executive action. And we will continue to work to take action to improve gun safety in this -- to reduce gun violence in this country through executive action, and hopefully Congress will take action to reduce gun violence as well. Should we expect action out of the White House? Or is this just more bluster from a president who continues to self-destruct his own credibility on issues both foreign and domestic. In reporting the DC shooting case, the New York Times makes plain old buckshot sound like the latest in high-tech tactical weaponry. The New York Times never ceases to amaze. I wonder if the writer understands Mr. Obama's shotgun would work much the same way... if he really has one. High school textbook alters the Second Amendment. Bikers put a show of solidarity with America ideals on September 11th. Now a page on Facebook says truckers may be next. 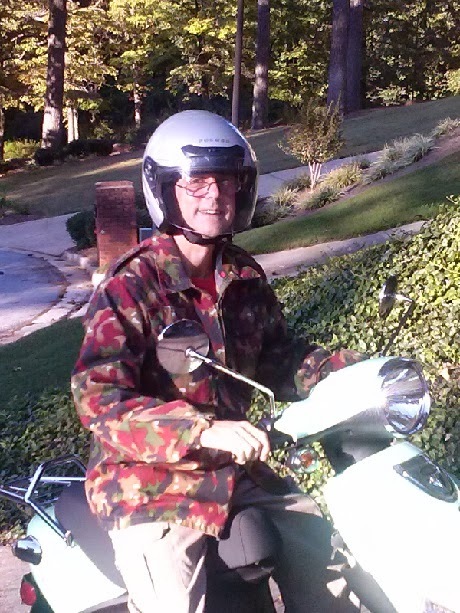 Of course, bikers are hobbyists, and trucking is big business. Remains to be seen how this plays out. But with today's just in time retail inventories, some businesses may well be impacted even if only a fraction of America's truckers take part in this stoppage. And many truckers aren't corporate, they're owner-operators who run their own rigs carrying contract loads for the corporate carriers. I heard that Overpasses for Obama's Impeachment would hold a rally today at the Georgia capitol, so I decided to check it out. Before I left, I checked the capitol calendar, and saw the "Atlanta Tea Party" had a scheduled event at 10:45am, and I assumed it was the same group. 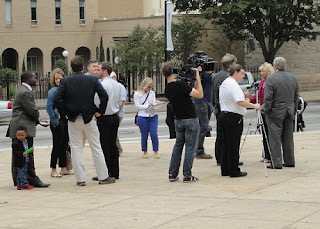 When I got the capitol, I saw a handful of folks, mostly in business attire, doing interviews. 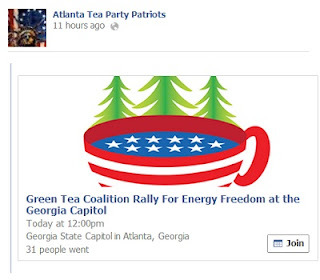 The Atlanta Tea Party group was apparently working in conjuction with something called the Green Tea Coalition, and was talking about something called a Consumer Energy Bill of Rights. A few folks had professionally printed signs declaring something about "renewable energy." I didn't stop to chat or listen, but the affair looked to me very much like politics as usual. I passed this Tea Party by when I saw the Overpass contingent staged across the street. The Overpass people looked and talked far more like the Tea Party I mingled with back in 2010. When did the Tea Party go corporate in appearance - and wonkish on energy? In Georgia, the overpass is optional. Some of the Georgians participating in Overpasses for Obama's Impeachment took their demonstration to a sidewalk across from the Georgia capitol today. How many people remember the role Congressman Cohen played in repatriating the Muslim radical who opened fire on Army recruiters in Arkansas? Prior to the June 2009 Little Rock shootings, Abdulhakim Muhammad had been held in prison in Yemen until Cohen urged the State Department to intervene and help bring him home, according to a 2009 report by the Associated Press. Pretty much describes yesterday's mass shooting target in Washington D.C.
Did the Obama team vet these opposition groups any better than it vetted the Muslim Brotherhood? Remember these comments from a couple years ago? The DC shooter had a shotgun. That's not the kind of gun the gun-grabbers have prioritized this year. Joe Biden in on record - "get a shotgun." Aaron Alexis had other guns, you say? Authorities are investigating whether the gunman took the D.C. police officers' rifle. You think the D.C. police don't know yet if the rifle belonged to a cop? The paperwork should be clean, and easy to access. Remains to be seen how a gunman with an alleged history of gun and anger issues was able to obtain the shotgun. But the knuckleheads who shrieking for another "assault weapon" ban may want consider where the past two mass shooters apparently got them. By committing murder or attempting murder. In addition, the shooting at a Portland, Oregon mall last year used a stolen rifle. The Boston bombers also killed a cop in an attempt to get a second gun. You really think more gun laws will dissuade people hell-bent on murder? About 500 trigger pulls in, I realized I loved target shooting. It relieved my stress; helped me focus on what I could control; boosted my self-confidence; made me feel strong, powerful and alive. It helped me work on overcoming other fears, too. The NFL's clear-only stadium bag policy. The NFL can spin this as a safety and homeland security measure all it wants. Looks to me like another indoctrination practice designed to wear you down into compliant sheeplehood. You're too stupid to have credit cards. 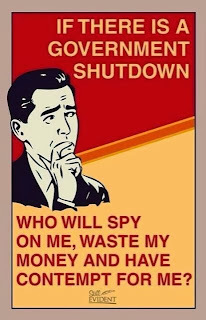 So, for your protection, the federal government will be watching how and where and when you use them. No, not the NSA. The Consumer Financial Protection Bureau. Consumer Financial Protection Bureau officials are seeking to monitor four out of every five U.S. consumer credit card transactions this year — up to 42 billion transactions – through a controversial data-mining program, according to documents obtained by the Washington Examiner. Government is ever so creative when it comes to creating new agencies for domestic spying. But it's all for your protection, of course. 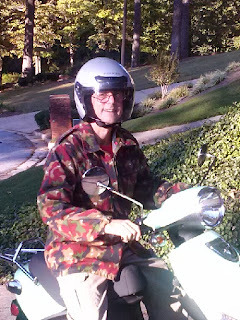 Don Dickinson and I continue to transition our radio program to BlogTalkRadio. Join us there at 1pm ET today, or catch the show archive later on the BlogTalk site. We'll also simulcast today on the old TalkSouthRadio site, the plan currently will see the old site go away at the end of this month. By grabbing someone else's money. Poland confiscates half the private pension funds there. Still think it can't happen here? Wow. Pollster PPP admits withholding polling data that ran counter to the progressive agenda. New York Mayor Bloomberg and his gun-grabbing allies poured about $3,000,000 into efforts to turn back yesterday's recall votes in Colorado, while proponents of the recall raised only $540,000. An epic national debate over gun rights in Colorado on Tuesday saw two Democratic state senators ousted for their support for stricter laws, a "ready, aim, fired" message intended to stop other politicians for pushing for firearms restrictions. Ousted were Senate Presidnet John Morse and state Senator Angela Giron. Bloomberg poured $350,000 of his own money into the Colorado effort. Gotta wonder how many U.S. mayors are rethinking their membership in Bloomberg's Mayors Against Illegal Guns anti-gun lobbying group this morning. The Second City crew nails the OFA infomercial style in this parody. 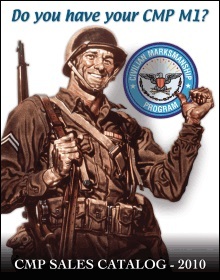 Recent news articles and references to the demise of the Civilian Marksmanship Program are erroneous. Business and programs continue as usual. We appreciate the continued support of all our customers. Okay, but do tell me more. Today's CMP statement follows proposed action by the Obama White House to ban the re-importation of World War II and Korean era M1 Garand rifles and M1 carbines to civilian entities. CMP shooting and marksmanship programs extend well beyond military surplus sales, but keep in mind its the surplus rifle sales that have historically funded the organisation. The Civilian Marksmanship Program, a 110 year old organisation created by Congress, has been selling Garands and carbines to qualified American civilian shooters since the 1950s. When the Obama administration announced its new re-importation policy on August 29, I didn't jump to conclusions. But I did ask what this might mean for the future of the CMP's surplus rifle sales programs. The CMP has traditionally obtained its rifles through the U.S. Army, often after the arms had been returned to the army by allied foreign nations. Now with the Executive Branch on record that it opposes re-importation of Garands and carbines for the civilian sales market, it remains to be seen whether the DOD will continue to provide repatriated arms for distribution by the CMP. For the time being, it's still business as usual at the Civilian Marksmanship program. And that's good. Its warehouses in Alabama and Ohio are still packed with cases of Garands (many of them apparently still un-inspected). 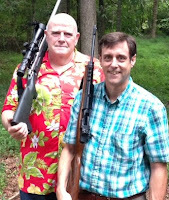 But long term, I think the picture's still murky about the prospect for selling military surplus rifles going forward. Except for a handful of highly collectible ones that get auctioned from time to time, the CMP sold out of M1 carbines several years ago - and has long said it expects to receive no more. Eventually, that will likely be the case with Garands as well, though an obstructionist Executive Branch could conceivably cause the available supply to dry up at home before military warehouses overseas are exhausted. Obama couldn't line up allies in support of bombing Syria. Obama couldn't even convince his wife. First Lady Michelle Obama opposes military action in Syria, President Barack Obama told PBS and NBC News on Monday. "My own family members... they're very wary and suspicious," President Obama told PBS. The incoherency of the GOP is mind boggling. 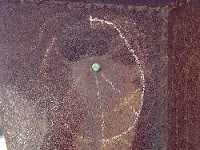 It self destructs by seeking presidential candidates as least aligned with its base as it thinks it can get away with. Meanwhile, its elected reps in Washington look for ways to please or appease the Dems, completely neglecting the wishes and views of their constituents at home. The GOP in DC acts as if it's suffering collective lead poisoning or some other form of dementia. Others have taken note of the GOP's departure from the American people. Among them is Angelo M. Codevilla, professor emeritus of international relations at Boston University. Check out his post at Library of Law and Liberty. Learned today that it's now taking Gwinnett County, Georgia three months to process firearms carry license applications and to get those licenses into the hands of applicants. I'm not sure what the turn-around time is in other Georgia counties, but it appears demand for carry permits remains high. Fortunately, for those who haven't planned ahead, there's a 90 day extension available for current permit holders that can be acquired at the time a new permit is applied for. Hadn't been in a gun store for a while, so I popped into one of favorite indy shops today in Gwinnett County (to the north and east of Atlanta). Last time I was in, the long gun racks were 60 percent empty. Today they were full. Lots of new stuff like ARs and tactical shotguns, and priced pretty much in line with what stuff was selling for last November (pre-Sandy Hook). I did note the section that used display used long guns was now mostly filled with new. My assumption is that folks aren't selling or trading what they have when they buy new. There were a few Mosins on the racks. 91/30s priced around $170, M44s at $189 and up. This time last year you'd see Russian Mosins usually selling in the $110 to $140 range. Ammo shelves were mostly full. Though a sign noted there was a 100 round limit on .22 Long Rifle rounds. Yes, there were boxes of .22 ammo on the shelf. I also went by a big box sporting goods store. It too was better stocked in terms of guns and ammo than my last visit to the firearms area in early summer. Most the handgun ammo is no longer stocked up front at customer service, it's back on the ammo aisle. The exception is 9mm and .22 LR which is still held up front. Several types of 9mm were on hand, but I didn't see any .22 as I exited the store. Back in the firearms area, there were numerous boxes of .223 rifle ammo from various makers. Various .45, .380 and other pistol rounds mostly filled their respective slots, with only a few spots on the shelves left completely bare. No purchase limits were posted other than for 9mm and .22, which continue to have a two box limit. On a related note, I saw a story from Al Jazeera America asserting some gun stores have gone out of business because they couldn't get enough ammo to sell. The story was from August, but I suspect it's noting something where the critical phase passed several months earlier. Things may not be there yet, but inventories and availability of guns appear close to normal, and ammo's recovery seems to be coming along nicely. Of course, there's always the possibility of another politically induced shockwave that could trigger another buying surge, leaving shelves empty once again. Invoking Trayvon Martin's name, the UN now seeks to meddle in U.S. self defense protections. 3 September 2013 – A group of United Nations independent experts today called on the Government of the United States to finalize the ongoing review of the case involving the death of teenager Trayvon Martin, an African –American teenager who was shot in 2012 by a neighbourhood watchman in the state of Florida. Has this group noted data that shows African Americans have disproportionately benefited from Stand Your Ground laws? I'm not going to hold my breath waiting for facts to get in the way of a UN entity's political agenda. H/T to Examiner.com for reporting this UN effort. But wading through the pop-ups on the Examiner site is more than I'm willing to sit through some mornings. Fired this off in an email a few minutes ago. I've added links to the post here for clarity. Seriously, Mr. Chambliss, how can a constructive debate be considered with so little factual information, or by building debate around one aspect of a two year old foreign civil war? I grow weary of our elected representatives attempting to rush through all matters of business without benefit of true study or even reading the resolutions or bills you vote on. 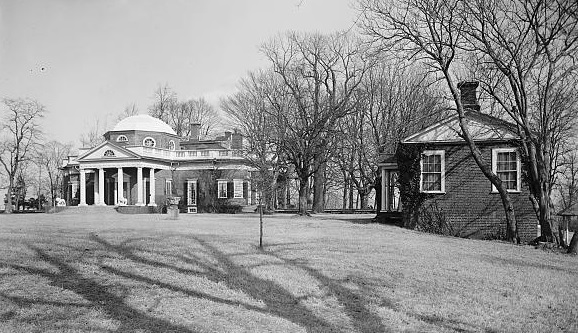 "What happened here was the gradual habituation of the people, little by little, to being governed by surprise; to receiving decisions deliberated in secret; to believing that the situation was so complicated that the government had to act on information which the people could not understand, or so dangerous that, even if the people could not understand it, it could not be released because of national security." The comment, recorded by historian Milton Mayer, describes the process of totalitarian consolidation in Germany in the 1930s. And this seems to be the way our two political parties in Washington DC treat American citizens today. You weren't elected to the senate to rush us into wars without it being a true matter of national security, or without benefit of true intelligence gathered on the circumstances. I've yet to see justification, legal or otherwise, as to why a civil war contained to Syria is a matter where the United States should insert itself in any manner, especially when there's plenty of documented atrocities being carried out by the factions that you and President Obama propose to aid. Perhaps it's time you again prioritized the will of the people of Georgia instead of those who tickle your ears in the backrooms of Washington DC. You can start by voting no on the president's ill conceived push to get us involved in yet another Middle East civil war. You must also stand strong in opposition should the president attempt intervention without the consent of Congress. An off-duty Chicago police officer fatally shot a man on the Near West Side this morning in the third police-involved shooting since midnight and the fourth in the last 24 hours, police said. At the time I'm posting this, the Trib's story was last updated around 1:30 pm Saturday afternoon. Remains to be seen if the count holds through the weekend. How desperate are Democrats to beat back next Tuesday's recall vote targeting two anti-gun lawmakers? How common is it for absentee voters to show up with ten ballots? 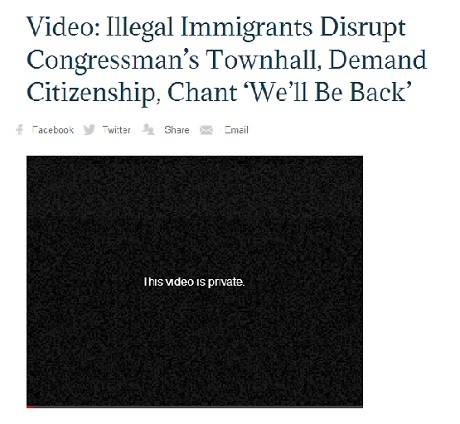 Congressman Pete Olson (R) of Texas apparently had a town hall meeting that was disrupted by illegal aliens. Fox News reported there's YouTube video of the confrontation. But after word of the video got out, it appears whoever posted it made the video private, denying larger audiences access to the see what happened. Why's that? "The supporters themselves recorded and posted the video... presumably to make themselves look good. We think it has the opposite effect." Seems to me, I recall that when conservatives packed town halls and got vocal during the health care debate in 2009, many a Dem rose up and called those citizens "terrorists." 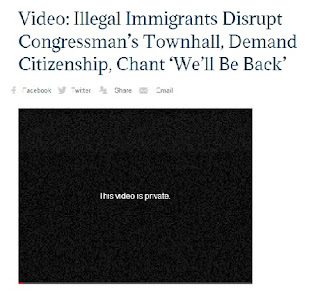 Will we hear the same from Dems now that self-proclaimed "undocumented citizens" are causing disruptions? Economic sanctions proposed to punish Chicago restaurants that fail to ban concealed carry. The adulterous former CIA chief and retired general emerges from the shadows to back Obama. 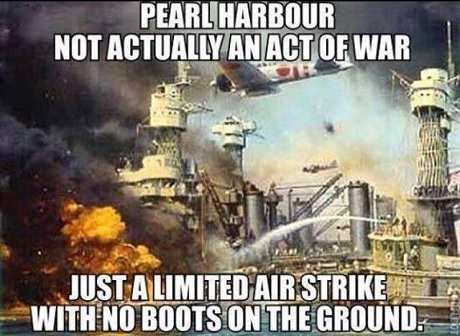 America has to bomb Syria to look like it's doing something about Iran or North Korea? Are Americans dumbed down enough to buy this? Oh, yeah. We have to protect Obama from himself. Um, no. We don’t, actually. He tried to use the American muscle he’s long disdained, wield a big stick, but his red line was a bluff. And just as they saw through Carter, our enemies see right through Obama; they know he has no clothes, and they laugh at, ridicule, and mock him. And frankly, he deserves it. In light of Putin pushing back over Obama's Syrian intervention fantasy, is Obama feeling like a fool yet for promising Russia he'd have "more flexibility" after the election? Is Obama still gung-ho about scrapping U.S. nukes? There is something going on here, a new distance between Washington and America that the Syria debate has forced into focus. The Syria debate isn't, really, a struggle between libertarians and neoconservatives, or left and right, or Democrats and Republicans. That's not its shape. It looks more like a fight between the country and Washington, between the broad American public and Washington's central governing assumptions. Government of the people, by the people, for the people seems to be concept either forgotten or ignored by many of those currently serving in Washington DC. And while it seems especially so among those in the Executive Branch, there are plenty of those serving in the Congress who would do well to reconsider a more traditional, restrained role for the federal government. Why is it the Obama administration wants to reign down fire on the Assad regime for its alleged use of chemical weapons, yet the same Obama team remains silent when reports out of Syria allege rebel atrocities - including the murder or execution of children? Check out the new show site at BlogTalkRadio. Yes, we'll be talking about Syria. There's talk that the Obama White House is dumping talk of limited intervention in favor of massive air strikes. Change in strategy, or was that the White House plan all along? When it comes to firearms, Washington DC is obsessed with political correctness. Washington police are operating under orders to arrest tourists and other non-residents traveling with spent bullet or shotgun casings, a crime that carries a $1,000 fine, a year in jail and a criminal record, according to a new book about the city's confusing gun laws. When was the last time anyone was shot with a spent round? The Obama administration has announced its intention to ban reimportation of World War II era M1 Garand rifles. To the best of my knowledge, the only time the Garand was used in a domestic school shooting was when it was a service weapon deployed in the hands of the Ohio National Guard. When gun control advocates talk about the United States’ history of mass shootings, they seldom include the Kent State Massacre. While they oppose the civilian ownership of “military style” weapons, they are more than willing to support the militarization of domestic police forces. But I must warn against allowing gun control advocates to frame the argument in a way to include antique rifles in the “military style” category. How about we get an update on his last "humanitarian" military intervention fiasco? Is this part of the reason the Obama team rushes to get the U.S. involved in Syria - to do so before people realize what a disaster the Libya intervention has been from start to present? 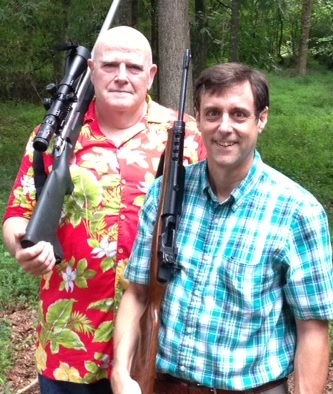 I spent a good chunk of Tuesday shooting on the private range Don has south of Atlanta. Ayn Rand began writing Atlas Shrugged on September 2, 1946. September 2nd is a recurring date in the story. I have no idea if the guy in the photo is really a sailor. 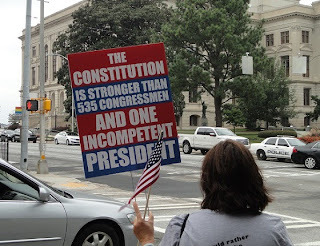 But many of those serving in our war weary military have to be thinking what his sign says. Teens who displayed pricey cellphones are held-up after Friday night's high school football game in Decatur, Georgia. The last incident happened at 10:40 p.m. The victim was walking with four friends near the Decatur High gym when three suspects approached them. The first suspect asked the victim for the time. The victim removed his cell phone from his pocket and provided the time. The suspect then grabbed the victim in a choke hold and demanded the phone. The victim refused and the second suspect pressed a small black semi-automatic handgun to the victim’s neck and the victim relinquished his iPhone4. Yeah, it's fun to have a cool phone. But when something like a cellphone makes you a priority target for armed robbery, it's time to either rethink your phone choice... or be more discrete in how or where you use it. Are you practicing situational awareness when using your phone? If your kids have flashy phones, have you talked to them about these realities?